Can I use someone else’s work in my content? The Internet and technologies today make it easy to find and reuse graphics, photographs, text, music, and other content. Before you copy and paste that content you find online, though, a word of caution: Using that image you found through a Google search or a video appearing on YouTube may violate copyright laws. Copyright is a legal protection for the original author of work. The content’s creator holds the copyright the instant that he or she creates the work; this ensures that the original author has the ability to publish, reproduce, distribute, sell and/or perform the work. If you are not the copyright holder, you must have explicit written permission to use their work, or you must purchase the rights to use the work. If not, you could incur fines ranging from $200 to $150,000 for each work infringed, plus attorney’s fees and court costs. You should always assume that a work is protected by copyright. There are numerous agencies that deal in fee-based stock music, photography, and video. Even if you have a limited budget, though, there may be additional resources you can leverage; a body of work may be available in the Public Domain. Or, an author may choose to license their work under a Creative Commons license. Works in the Public Domain are not subject to copyright. The rights to copyright protection have either expired, do not apply or have been surrendered by the original author. No permission is needed to use these works in your content. Works within the public domain should be marked with the Public Domain Mark 1.0. Creative Commons licenses allow authors to share their work with varying levels of restrictions: non-derivative, share-alike, or non-commercial. If you agree to make no changes to the work, the restriction is non-derivative. Or, a work may be shared if you agree to allow others to use your content as well; this is the share-alike restriction. Other works can be shared only if you are not going to sell the resulting product; this is the non-commercial restriction. Whether you use a work that is copyrighted or licensed under creative commons you should always attribute the work to the original author. Properly attributing the original author is a best practice and required for use of copyrighted and creative commons protected works. 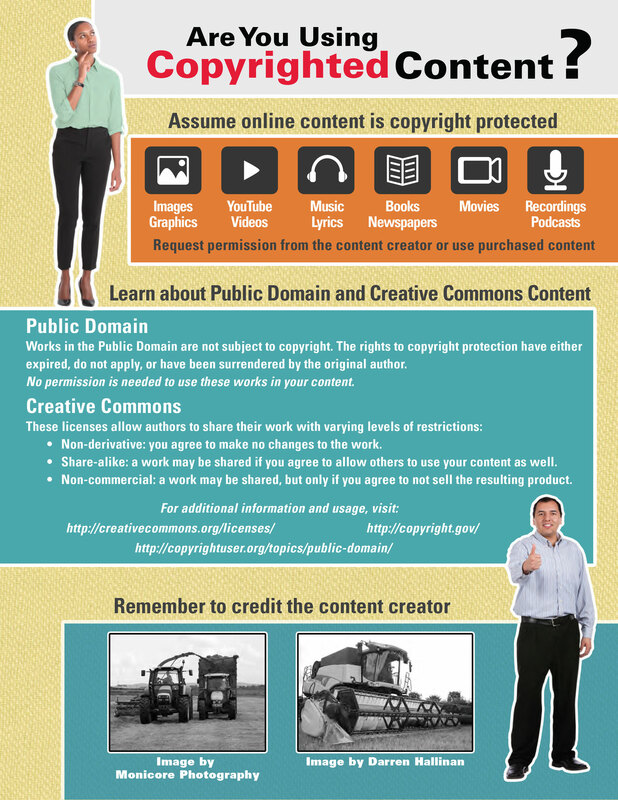 Print and share the attached Creative Commons Copyright Infographic for an overview and license marks to look for. Visit the U.S. Copyright Office for even more information on copyright and the law. 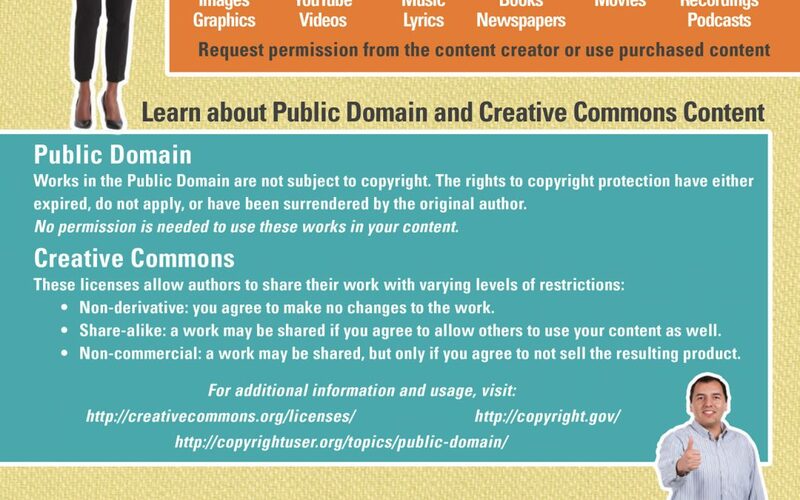 Learn more about the Public Domain at Copyright User website. Visit the Creative Commons website to learn more about Creative Commons licenses and use. Always refer to your company’s guidelines on copyright and use of materials. The information presented here is not intended to replace the guidelines provided by another company or institution. 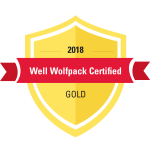 Disclaimer: The content of this blog post is intended to convey general information only and not to provide legal advice or opinions. Download a PDF of the Copyright Infographic. Right click and select ‘Save As’. Katherine Bennett leads the Instructional Design team for NC State IES. She also serves as project manager for instructional design services. Katherine plays a key leadership role in supporting the IES goal of providing instructional design and development expertise that complements the field-specific expertise of IES partners, while meeting the learning needs of target audiences. Katherine holds a bachelor’s degree in Computer Science from the University of North Carolina at Charlotte and a master’s degree in Instructional Technology from East Carolina University.